Scout Taylor-Compton started her career at a very young age in independent short then progressing to TV/films such as Ally Mcbeal, ER, 13 going on 30, sleepover, charmed, and The Runaways. She is most notably known as “Laurie Strode” from Rob Zombie’s, Halloween 1 & 2. During the Horrorfind Convention, I had the chance to sit down with Scout and talk to her about her convention experience. Rachael: So Scout, How is the weekend going? Scout – Great, going very well so far it’s very packed with people. Everyone is very nice and I always love meeting my fans. How do you like doing conventions? Scout – I like doing conventions. I am a huge horror fan myself. My dad is a mortician. I used to visit him in the mortuary when I was younger. It was my parents who introduced my to horror movies as well, so I have no problems with horror related stuff. These conventions are like a candy store for me. Rachael: How do the horror fans treat you? Scout – They are the best. I love the horror fans because I am one myself. I could talk a long time about horror movies in general. Sometimes we talk so long I forget why I am here. (lol) They are all really nice and always say nice things about my work. Rachael: Do you have a favorite or memorable fan moment? Scout – Well, I love talking to my fans in general. But I guess my most memorable moments are when fans come up to talk to me and they start crying because they are happy to see me. Or even this one time a fan fainted in front of me, so I gave her some water until she felt better, then gave her a hug. I felt bad that it happened and just wanted her to not to feel embarrassed by the situation. And I am a huge little mermaid fan and I mentioned it once on twitter and people started bringing me little mermaid stuff. So that was really cool of them. Rachael: Any future Con plans? Scout – Not sure right now because I have a lot of projects coming up. Rachael: You mentioned projects, which leads me to my next question: What projects are you working on? Scout – Well, I have a few things coming up. Dee Wallace and I are hosting a Haunted Mansion for Halloween. I have a new movie called “Silent Thief” a psychological thriller which I just finished with Tobey Hemingway, Cody Longo, Reid Ewing, Kurt Fuller, John Billingsley and Frances Fisher; directed by Jennifer Clary. And I also have a new movie that just got green lit, which I wrote, but I can’t really talk about that right now. But as soon as I can I will tell everyone all about it. Rachael: Most people know you from the Rob Zombie Halloween 1 & 2 so I wanted to ask. What was harder to do 1 or 2? Scout – H2 was definitely harder it was much more physical and challenging. Rachael: Do you still keep in contact with your Halloween family? Scout – Oh yeah, I am still very close to the whole cast. We are like a family. Scout – Chucky. I love child’s play. I got the chance to meet Brad Dourif, you know the guy who voices chucky, so that was pretty awesome. Rachael: I know I asked you all horror/convention questions so I would like to ask one fun off track question: How many tattoos do you have? Rachael: Thank you for taking time to sit and talk to me. You’re great and I hope to see you again at another Con. Scout – Oh your welcome. No problem. Thank you. Rachael: If people want to see what you’re up to, how should they do that? Also, just so fans know, Scout doesn’t have a face book account, so any you find right now are fake. 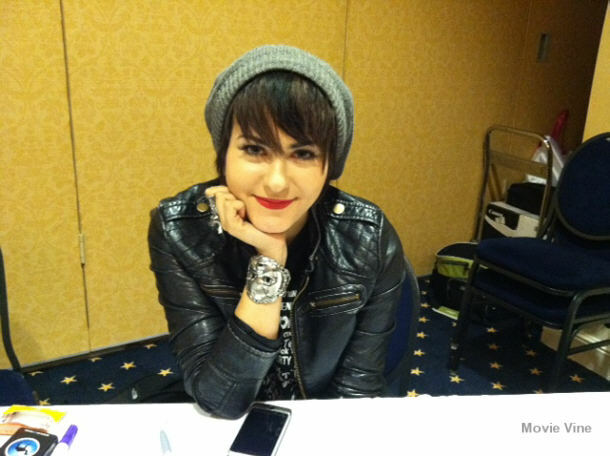 If you want to be part of a real verified social site with the real Scout Taylor-Compton please follow her on twitter. You can check out her IMBD page which will give you a full history of films you can see her in. Including any information on any new upcoming Halloween movies as well can be found there. *Writers Opinion*After speaking with Scout I have become more of a fan not of only of her work but of her. I watched her for a bit, talk to her fans, and she really talked to them. Talking about everything from how she liked a horror shirt they are wearing to asking what their favorite horror movie was. She was very personable, friendly and gracious to each and every one of her fans and made each one of them feel very comfortable talking to her. I could see in each fan that they felt like they just talked to a friend not a celebrity. There are currently 1 Comment on An Interview With Scout Taylor-Compton. Perhaps you would like to add one of your own?